Things on My Kitchen Counter | Cook It Quick! Recently we had new kitchen counters installed at our house. In taking everything off the counters, I began to re-evaluate what I was going to put back! What was really important to me and would help me cook quick, healthy meals? And (this is an important AND!) … would make my kitchen a pleasant environment for cooking. Kitchen organizers recommend only keeping items you use several times weekly or a daily basis on top of your kitchen counter. Here’s what made the cut and stayed on top of my counter. Several fruits continue to ripen at room temperature. This inexpensive 2-tiered fruit stand (shown above) offered an attractive counter-top storage space. Fruits that benefit by room temperature storage as they ripen to perfection include avocados and tomatoes (botanically, they are fruits), kiwifruit, nectarines, peaches, pears, bananas, and plums. Place a counter-top fruit stand in a clean, dry, well-ventilated place, away from direct sunlight and away from areas where meat is prepared. It’s recommended storing garlic, onions, and potatoes in a well-ventilated area in the pantry. Protect potatoes from light to avoid greening. But what if you don’t have a pantry? I found some storage canisters on the Internet that allowed ventilation and prevented light from reaching the potatoes. 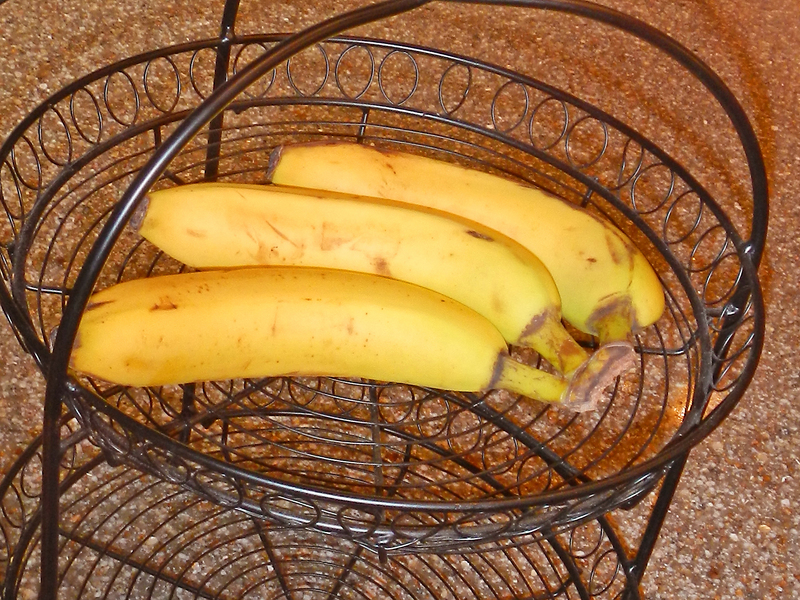 And … they looked attractive on my kitchen counter. There also are several brands of decorative cloth storage sacks that provide ventilation and protect from light. Some of the sacks can even be hung from the wall. Individual plastic or wire baskets work well in a pantry. 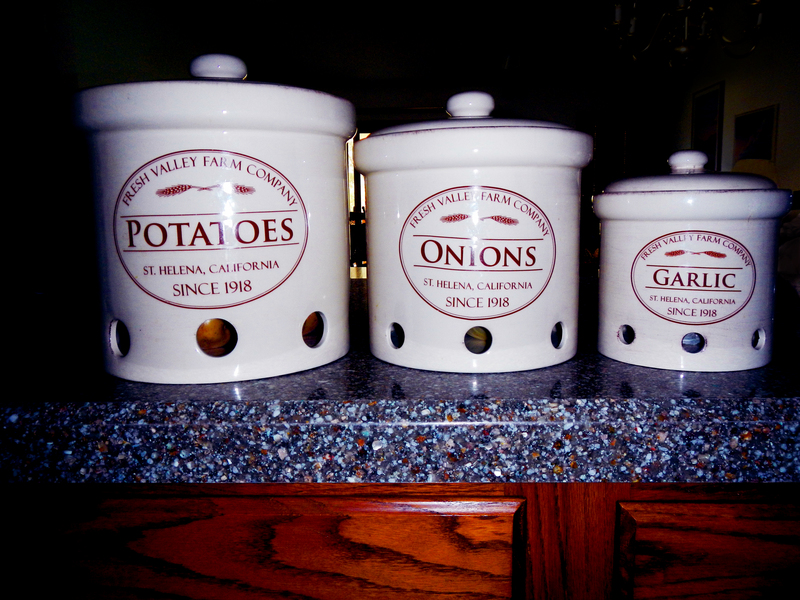 The holes in these canisters provide ventilation for my potatoes, onions, and garlic. Research by Washington State University found the best method of safely grilling meats is using a double-sided (clam-shell) type grill that cooks both sides of the meat at once. 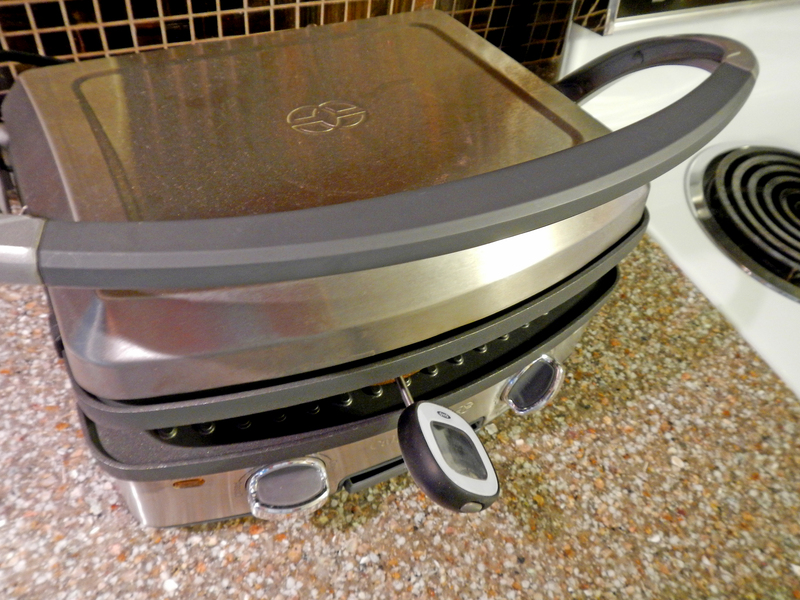 These grills also are one of the fastest and easiest means of grilling meat. And, they are easy to clean … especially nice when someone else in the house helps by cleaning up after you cook! An added benefit of a clam-shell grill is the ease of taking the temperature of thin cuts of meat from the side. According to an U.S. Department of Agriculture study, 1 out of every 4 hamburgers turns brown in the middle before it reaches a safe internal temperature. Using a food thermometer is the only way to assure a safe temperature. Check this USDA chart for safe minimum internal temperatures. It is easy to insert an instant read thermometer into meat on a double-sided (clam-shell) grill to check its temperature while it is cooking. At our house, there are almost always dishes in the dishwasher; dishes waiting to go in the dishwasher in one of our sink basins; and the other basin is in use cleaning fruits and vegetables, rinsing items. etc. At the same time, there are items that need to be hand washed for various reasons. 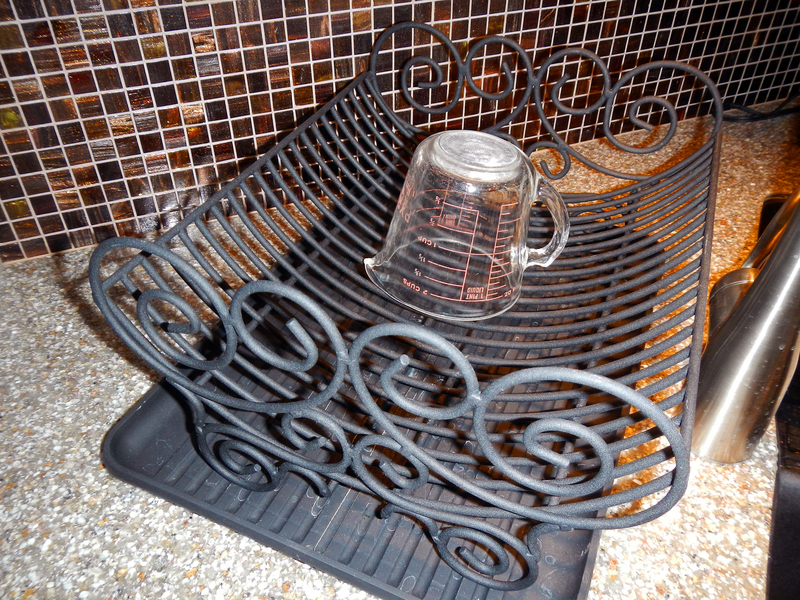 Our dish rack was always out. Then, I discovered on the Internet several decorative dish racks that actually look attractive sitting on your counter-top. If your dish rack has taken up permanent residence on your counter-top, it’s possible to find one that is both functional and decorative. There are some items, such as my mixer and food processor, that are too heavy to keep lifting in and out of storage. Along with my counter-top make-over, I gave them an update also. 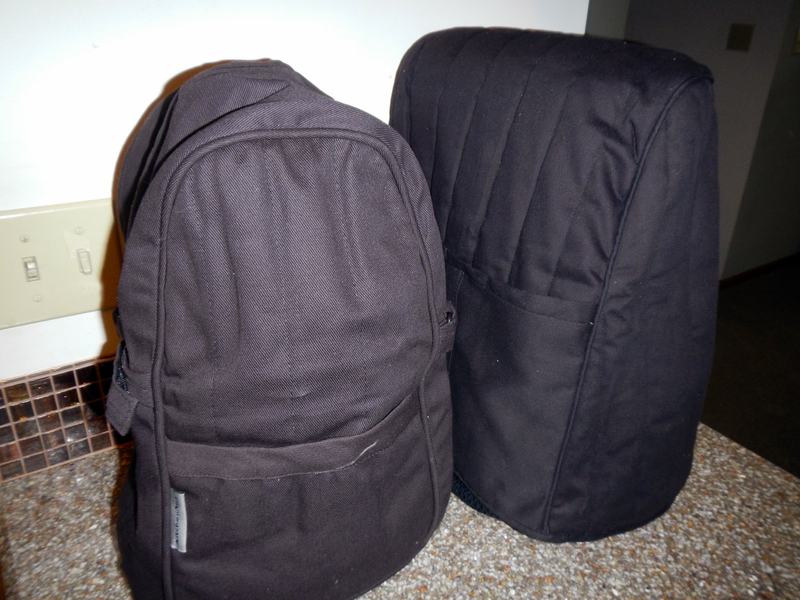 They are now protected from dust and have their accessory parts conveniently located in pockets with these covers. An Internet search for “mixer cover” or “food processor cover” will locate several options for these items. Covers for heavy counter-top mixers and blenders help keep them clean and dust-free. There are lots of colors, so you can match them to your kitchen decor. I’d love to hear from you in the comment section what you keep on YOUR kitchen counter! This entry was posted in Kitchen Tips and tagged Cook, Countertop, Fruit, Kitchen, Meat, potato. Bookmark the permalink.